My profession has thankfully allowed me the opportunity to live in foreign countries. And for me, one of the great pleasures of living in foreign countries is the ease of foreign travel. As much as I like living in the United States, it is a very big country so it is a lot harder to just leave the country for a long weekend. Again my profession affords me a lot of time off in the form of long weekends. So when I live overseas I like to maximize those long weekends. That was what I did this past weekend. 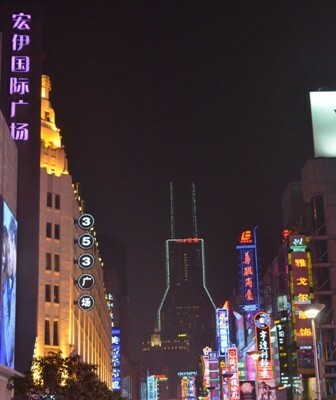 I fully intended on spending four full days in Shanghai, and I got close. When you travel on limited amount of days to a place where there is a LOT to see and do, every moment counts. So I try to get one of the earliest flights out and one of the latest flights back in. That was my intent for this trip. My flight out of Seoul was at 0855 and I SHOULD have arrived in Shanghai around 1000. Alas, this was probably about the longest flight delay I’ve ever experienced at eight hours. It was so long, I decided to take the 45 minute train back to my apartment and relax there on the Internet rather than hang around the airport for the equivalent of an entire work day. Of course it could be completely worse, but it was frustrating to lose an entire day of travel, because I didn’t arrive in Shanghai and get to my hostel until around 2000. What was great, and saved a ton of time was the ride on the maglev (magnetic levitation) train to and from Pudong Airport. If you are ever in Shanghai, I HIGHLY recommend the maglev train. A round trip ticket costs 80 RMB (roughly 13 USD), and it is completely worth it. The 19 miles between Pudong Airport and the metro stop of Longyang road is covered in under 10 minutes with brief top speeds of 400 kph (248 mph). The maglev train is fast and smooth, and cuts down travel time significantly. I mean, who likes to waste time getting to and from the airport when you can cut out the traffic entirely? That just means more vacation time for you. Since it was relatively late when I got to my hostel, and I was tired, I only walked around a bit. I was staying just off East Nanjing Road, which is a major pedestrian shopping street between People’s Square to the west and The Bund to the east. 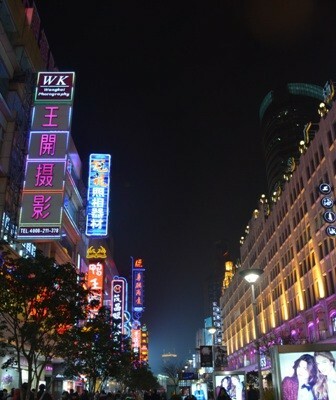 I have more night pictures of Shanghai in a future post, but the whole street was bright with a multitude of neon lights and it was buzzing with activity and people. It’s like Seoul or Tokyo or London or even Las Vegas. I saw more than one instance of Shanghainese dancing music routines in the street. I could never figure out if this was just an exercise routine or had some deeper meaning, but the participants knew all the dance steps and were dancing in time with each other. Even for someone who has spent a lot of time in large cities (and in fact I live in Seoul now), all the people, noise, lights and activity were a bit overwhelming at first. This entry was posted in Travel and tagged China, MagLev train, Nanjing Road, Shanghai.